Deciding on whether or not to enroll in a graduate degree program -- as well as choosing a specific field to study -- can be difficult. There are many factors that go into making this choice, not the least of which is how much people can earn when they graduate. The good news is, depending on the field, investing time and money into a graduate program is a solid idea financially: According to the U.S. Bureau of Labor Statistics, people who complete a master’s degree earn an average weekly salary of $1,401—up from $1,173 for those with a bachelor’s. If they continue on to complete a doctoral degree, they can earn even more, as the agency reports these workers on average are commanding $1,743 weekly salaries. In addition to information about salary and career paths, this guide provides a look at factors that go into the graduate school decision, as well as helpful resources to investigate graduate schools. Since graduate degrees typically come with a high price tag, the return on investment simply can not be ignored. In this section, we explore how students can choose career paths to leverage their advanced degrees and earn higher salaries than they would if they ended their education on the undergraduate level. One major motivator for attending graduate school is the ability to increase earning potential and eligibility for higher-level jobs. The chart below illustrates how increased education can lead to advanced job opportunities and salaries in different occupations. For example, those in the nursing field can begin their career as a registered nurse at $73,550 per year, and as they increase their education, they can become a nurse practitioner making $107,480 annually and then a nurse anesthetist earning $164,030. Similarly, health care workers with lower-level degrees can get entry-level positions like physical therapist aide, where they earn an average of $27,910 per year, and as they continue their education to the graduate level, they can move up to positions like exercise physiologist and physical therapist, where they can make annual salaries of $50,310 and $87,220 respectively. How can a student know if a graduate program is the right choice for their needs and goals? Although every student is different, the following do’s and don’ts can assist students no matter what degree program, school, or occupation they’re considering. Do research professors and get to know them. When looking at graduate school programs, prospective students should investigate the areas of expertise of the faculty to determine if these topics align with their own interests. In addition, meeting the professors will give them an idea of how easy they are to work with and how much they’re willing to make themselves available to students. Since graduate students are required to work so closely with faculty, it’s important to find out if the relationship will be a positive and productive one. Do get to know students and alumni. Talking to professors is a good step toward finding out what it’s like to attend a school, but in order to get a fuller picture, a prospective student should also make an effort to speak to current students in a program, as well as alumni. These are the people who will share the realities of what it’s like to attend a school from a student’s perspective, and alumni can give a look at how completing the program impacted their job options. Since graduate school is such a huge financial investment, students should consider how much the tuition costs at each school they’re thinking about, where the money to pay for it will come from, and what their earnings will realistically be after completing their degree. Finding scholarships and grants can help decrease the financial burden and help students lower their dependence on loans. Do think about the school’s behavior. When evaluating a particular school, students should think about how they have been treated during the application process. Was the program department welcoming or did they treat candidates like they were just a number? This is important because if the experience is bad before enrolling in a program, it is not likely to improve. Doing a side-by-side comparison of schools can help students judge each one based on their merits and find the one that stacks up with what students really want. Making a spreadsheet and updating it throughout the process is an efficient way to keep track of important information about each school. Don’t make reputation the most important factor. Although many students believe that they have to attend a top-tier school in order to get the best bang for their tuition bucks, it’s only helpful if the school has programs that meet their career needs. Employers are more concerned about attracting job candidates that have the right training than they are about whether or not they attended a top school. Is a program highly competitive or more casual? Are there activities on campus that people in a specific field can participate in? Although graduate school is not as socially-driven as undergraduate life, people should still think about the intangibles that will provide a good or bad experience during their time there. Don’t gloss over out-of-classroom requirements. For many students, graduate programs require much more than work inside of the classroom. Students should look at factors such as required research, labs, and internships in order to evaluate whether or not all of the program expectations can be incorporated into their lifestyle. People who have outside responsibilities like children and full-time jobs should really think through how much time they will have to devote to every aspect of their lives. Will job performance or home life suffer because of graduate school? Or will there not be enough time to get schoolwork done because of outside expectations? In order to get the most out of earning a graduate degree, students need to have balance. Although following intuition is not the most logical way of choosing a graduate program, when students have an inherently bad feeling about a school, even though it sounds good on paper, this should not be ignored. Sometimes the subconscious mind is able to pick up on a problem before we are consciously aware of it, so people should keep in mind that they may be having these negative feelings for a reason. Students can reap many benefits from attending graduate school—but only if they’re ready. People who are on the fence about whether or not it’s the right time to go back to school should ask themselves the following questions. Are you passionate about the field you want to study? Are you ready to be challenged academically? Will earning a graduate degree help you advance in your career? Will earning a graduate degree help you transition into a new career? Have you researched what graduate school is like? Have you done a cost-benefit analysis of a graduate degree to determine if it makes sense financially? Have you researched graduate school funding sources? Will going to graduate school increase your job prospects? Have you done everything to meet the prerequisites to get into the program you're interested in? Does your family support your decision to go back to school? What should students look for in a graduate degree program? Easley: A prospective graduate student should look for a program with strong customer service. From admissions to graduations, ideal graduate programs should be prepared and able to answer questions, make themselves available outside of the classroom and provide key academic resources to meet learning needs as they occur. When changing careers and engaging in learning in a new area, the initial learning curve may be steep and then additional academic resources will be needed. Moreover, even adult learners need advisement and mentorship. Primavera: When students ask me about applying to a graduate program, I tell them that the first factor to consider is the school’s geographical location. Do they have to stay at home? How far away would they consider moving if they found a program that interests them? I encourage them to think about including quality programs that offer what they might want in a graduate program. Some students can't move for family and practical reasons, others have not considered studying in another place. In my experience, students from New York often find it difficult to consider programs out of the local area. My colleagues in other states tell me that they have the same issue with students in their programs. For those who can move, I suggest they consider all possible alternatives including foreign programs. In considering a graduate program, one must consider the programs that offer the degrees and programs that are of interest to the student. I encourage students to take advantage of the material they can find on the Internet. Taking time to research schools that might be of interest is essential. Some disciplines have specific sources that will help in doing the research. For example, the American Psychological Association publishes a very extensive book that describes all of the important features of all psychology graduate programs in the country. Thomas: When selecting a graduate school, it’s important to consider what your end-goal is and what degree will get you there. Graduate school is an investment in yourself—you will advance your career or allow for a career change and have a greater earning capacity. With that in mind, consider delivery models, faculty, and cost when searching for a graduate program. As an adult, you are juggling much more than you probably did as an undergraduate student. What is going to work best for you? Can you go full-time or part-time? Does the program offer online, hybrid or face-to-face models? How long does it take to graduate? Are the classes weekends or weekdays? Knowing your bandwidth and preferred method on instruction can help narrow down your options. It’s important to familiarize yourself with the faculty within your program of interest. What industry and/or research experience do they have? What are their academic specialties? What type of advising and mentorship is offered? Compared to your undergraduate program, most graduate programs are small in nature so should be accessible and willing to mentor you. Cost is always an important factor. 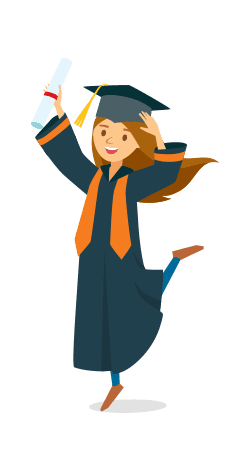 Graduate scholarships are not as common as undergraduate scholarships but graduate financial aid is not based on income, credit score, or need like it is for undergraduate programs. Remember, value should always be a factor when considering the monetary cost. What are the most important factors that students should consider when looking at graduate school programs? Easley: Each graduate school provides a unique advantage, depending on the needs of the potential student. The overall academic quality of the program to meet a student’s professional and personal learning goals is an essential consideration. While national rankings are important, they do not tell the whole story. Certain employers seek graduates of particular institutions that are based on the alignment between program quality and their institutional needs. Are the programs offered by the colleges or universities well regarded? The answer to this question can be found by having discussions with professionals who work in that field. The student can talk to their professors and others who they might know who work in the profession of interest. How will they pay for the program? For example, do the programs of interest offer financial support? Full-time graduate work is often possible only if scholarships and/or assistantships are available. Making a proposed budget for the expenses the student can anticipate will help in deciding what financial support the student will need and where they can get that support. Discussions with financial aid personnel at the potential colleges or universities will often be helpful. This can be done, in-person, by phone and/or email. Does the program offer exactly what the student wants? Will it provide the qualifications to work in the field they are interested in? If the student is pursuing a degree that leads to professional licensure or certification, they must make sure that it will qualify for that licensure or certification in the place they plan to live after they complete their degree. If the student is going to consider a program that requires them to move, what housing and other living arrangements are available? Does the school offer dorms to graduate students? Is there a meal plan available? What is available to support quality of life while they are a student? Discussions with students currently attending will help in providing answers to these questions. How can students weigh one program against another when making this decision? Easley: When weighing several graduate programs against another, students should consider overall program quality and cost, the availability of financial aid or grants (if needed), accessibility and flexibility of course offerings to meet scheduling needs, and ultimately, if it fits the student’s personal and professional learning goals. Primavera: Once a student has a list of potential graduate programs, I suggest they contact the programs they have interest in and, if possible, schedule a visit to see that program up close. If they are able to visit the programs of interest, they should try to talk to their professor in charge of admissions (not the admissions office). It is also a wise idea to ask that professor to introduce them to some of the students currently attending the programs. It is wise to speak to a number of students who are at different stages of the program (first year, second year, etc.). This will give the student a good idea of what the student experience is in that program. If a student can't visit the programs of interest, they might consider an email or phone conversation with those who do admissions (again, not the admissions office) and ask if they can speak or correspond with current students. Once a student has gathered as much information as they can, I suggest they make a comparative chart that might help them in making their choice. This chart can contain all of the factors I have mentioned above. Thomas: While you may think campus visits are only for high school students, prospective graduate students can get clarity on which program is right by visiting the university. Schedule an appointment to speak with the department chair, faculty, or academic advisor. You can even ask if you could sit in on a class. What are some of the wrong reasons for choosing a certain graduate degree program? Easley: When choosing a graduate degree program, considering name recognition, in the absence of affordability, accessibility, overall quality and available student services, would not be the best idea. Unfortunately, families do not always plan sufficiently for graduate funding. Graduate study, at the expense of growing debt, can be offset by a myriad of grants available from private and public organizations. Employers may even provide financial assistance in the form of tuition reimbursement. Primavera: It is not wise to choose a program because it is convenient. Some students attend a graduate program at the college or university at which they got their bachelor's degree, even if that program does not meet their needs. This is not to say that attending a graduate program at your bachelor's institution is always a bad idea, but making that choice based on familiarity or convenience is not a wise idea. Choosing a program purely based on practical considerations will often result in settling for a less than optimal choice. Not all programs require full-time attendance and therefore some students will often choose to work full-time or part-time when they attend a graduate school. Even if the student attends a graduate program full-time, they may need to work in order to provide the resources they need. It is critical that students who plan to work think about how they will try to balance the demands of work, graduate school, and their personal lives. Even if a student doesn't plan to work while attending a graduate program, they should consider how they will balance all aspects of their lives while being able to give their time and effort to being successful in their graduate studies. Thomas: Graduate school should not be the “next step” after you complete your undergraduate degree unless you have a clear direction on where you are headed. Don’t use graduate school to buy time to enter the workforce. It could be a costly mistake! Because financial aid works differently (not based on income, credit score, or need) at the graduate level than at the undergraduate, some students are unwise in using more financial aid than needed. Be wise when you take out loans and only take what you need. A graduate degree should prep you for the next career advancement, not burden you with debt. Should prospective grad students consider certificate programs? Do graduate certificates yield the same benefits as an entire degree? Easley: Graduate certificates are an ideal way to increase someone’s learning in a particular area in less time than it would take for a full degree program. For professional areas that require ongoing retooling and training, adding a graduate certificate is ideal. Many institutions may consider accepting a certificate’s earned credits towards their masters' degrees. Primavera: Certificate programs are generally only valuable if they provide a qualification for a specific job. Most graduate degrees are designed to provide someone who already has basic credentials with some special skill or knowledge. Certificates are valuable for that purpose but not as substitute for a graduate degree. Thomas: The benefits of graduate certificate programs as opposed to an entire degree depend on the industry and personal goals. Often graduate certificate courses are included in a degree program so if you reconsider, those certificate classes can count towards the degree program. What advice would you give to people considering graduate school? Easley: As someone who has pursued several graduate programs through my career, I strongly recommend the consideration of overall lifestyle and an individual’s commitment to graduate study. Timing is important. Be prepared to meet the demands of graduate study as it requires one to prioritize her/his schedule, secure day-to-day childcare, adjust family and familiar relations and reorganize other responsibilities in order to sufficiently meet multiple demands of a full academic, professional and personal life. A future student should also cultivate a strong support network to help navigate these demands. The ultimate aim is success in every aspect of life including academically, professionally and personally. Primavera: I always tell students that choosing a graduate program is like going on a date, not making a marriage. No matter how one plans or researches, actually attending the program is the only real way to know if you have made the right choice. I tell students not to be afraid to leave a program if it turns out they believe they made the wrong choice once they get there. This may be difficult, but one must remember that an education sets the pattern of your career. I am not suggesting that students jump from program to program when things get tough but that they not consider choosing a graduate program as an irrevocable choice. Graduate school is a huge step, so those considering an advanced degree should get as much information as possible before making it. The following are some additional resources that prospective graduate students can use to understand exactly what they’re signing up for when they enroll in a grad school program. 5 Mistakes To Avoid When Paying For Grad School: In this article, Forbes warns people of the common financial mistakes that graduate students make. 5 Things You Need to Know About Graduate School: Students who want to go to graduate school can get an idea of what it’s like from this article from U.S. News & World Report. 7 Big Differences Between College and Graduate School: This article provides a look at what graduate school is like by comparing undergraduate and graduate studies. 10 Working Parents Reveal How They Juggle It All: While this Glassdoor article provides advice for working parents who are juggling the office and their family life, graduate students with children can also use this advice to attain school-life balance. 50 Things Only Grad Students Will Understand: The life of a graduate student is discussed in this article. ABA Law Student Podcast: The American Bar Association’s Law Student Division provides insights about law school in this podcast. Topics such as using legal technology, coping with depression, and dealing with student loans are discussed. Admissions Straight Talk Podcast for Grad School Applicants: Those who are interested in attending graduate school can get pointers from this podcast. Hello PhD: This podcast gives a comprehensive look at what students should do before, during, and after a doctoral program. How to Apply to Graduate School: In this video, Carla Trujillo, Graduate Division Diversity Program Director at University of California, Berkeley, provides advice for hopeful graduate students going through the application process. Mentally Preparing for Graduate School: This article from Northeastern University is designed to help prospective graduate students mentally get ready for graduate school. Preparing for graduate school: The University of California offers advice to future graduate students on this page. Rock Your Research with Chris Jones: Doctoral students receive advice from past and current Ph.D. students in this podcast. Should I Go to Medical School? 7 Questions You Should Ask First: Those who are considering medical school can get some information to help them make their decision on this page. The 5 Virtues of Successful Graduate Students: The Chronicle of Higher Education describes the characteristics grad students need to be successful in this article. The degree debate: Should you get a master's or Ph.D.? : In this article, USA Today weighs the pros and cons of getting master’s and doctoral degrees. The Inside Scoop About Law School: This YouTube playlist on the LegalEagle channel includes information on getting into a prestigious law school and being successful once there. This is Grad School: In this podcast, two doctoral students talk about the realities of graduate school. Tips for Dealing with Stress: Attending graduate school can be a rewarding experience, but also a stressful one. In this article, Duke Graduate School offers advice on how to handle the stress that comes with being a grad student. Use These 5 Strategies to Pay for Graduate School: U.S. News & World Report outlines strategies for paying for graduate school in this article. What I Wish I Knew in Grad School: Current and Former Students Share 16 Tips: In this article, Psych Central Associate Editor Margarita Tartakovsky discusses the hard lessons she learned during her time in graduate school. Betsy Thomas earned her B.S. in Organizational Communication from Murray State University and M.A. in Corporate Communication and Public Relations from Barry University. Betsy joined Barry University in 2009 and has served as the Director of Recruitment and Admissions for the School of Education, Director of Undergraduate Admissions and currently the Director of Graduate Admissions. Prior to Barry, she worked at Tarrant County College’s Continuing Education Department in Fort Worth, Texas. Her professional interests include organizational change, continuous improvement and enrollment marketing. Dr. Jacob Easley II is currently Dean of the Touro College Graduate School of Education. He previously served as Dean of the School of Education and Professional Studies at Eastern Connecticut State University, where he strengthened a multitude of academic programs departments and collaborated with leadership to promote quality undergraduate and graduate teacher education programs. He also chaired the Education Division at University of Pittsburgh-Johnstown. Dr. Easley earned his PhD in Educational Leadership (Curriculum and Supervision) from the Pennsylvania State University, an MA in Applied Linguistics/English from Indiana University of Pennsylvania, and his bachelor’s degree in Spanish from Morehouse College. He also holds a graduate certificate in Educational Administration from Georgia State University. Dr. Louis Primavera, PhD, received his BA in Psychology from St. John’s University and his MA and Ph.D. in Neuropsychology from the City University of New York. He is a New York State Licensed Psychologist and has training in behavior therapy and rational emotive behavior therapy. He had a private practice for more than twenty five years and specialized in marriage counseling. Dr. Primavera is currently the Dean of the School of Health Sciences at Touro College and was the founding Dean of the Graduate School of Psychology at Touro College. Previously he was the Dean of the Derner Institute of Advanced Psychological Studies at Adelphi University for six years and is professor emeritus at Adelphi. Before going to Adelphi, Dr. Primavera was at St. John’s University for nineteen years. At St. John’s he taught in the doctoral and masters programs in psychology. He also held the post of Chair for six years and was Associate Dean of the Graduate School of Arts and Sciences for four and one half years. Before going to St. John’s, Dr. Primavera held full time faculty positions at Hofstra University, St. Francis College (where he was department chair) and Molloy College.